This is a perfect example of how political correctness has run amok in this country. One person is “offended” by something, so the rest of us – who are in the vast majority – have to cowtow to that one person. We see it everyday in other situations where a small minority of people, such as the LGBT community, global warming advocates, electric car fanatics, people opposed to the American flag, or people who want English spoken in schools, etc., who will impose their lifestyle and beliefs on the rest of us. God help you if you hold a different view, because you’re likely to be called “homophobic,” “anti-environment,” “racist,” and the list goes on and on. 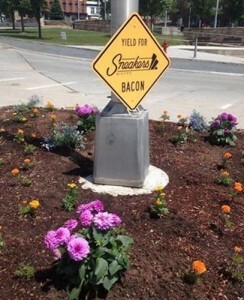 The owner of a Vermont diner, Sneakers Bistro, recently participated in a community effort to plant flower beds in the city’s traffic medians. 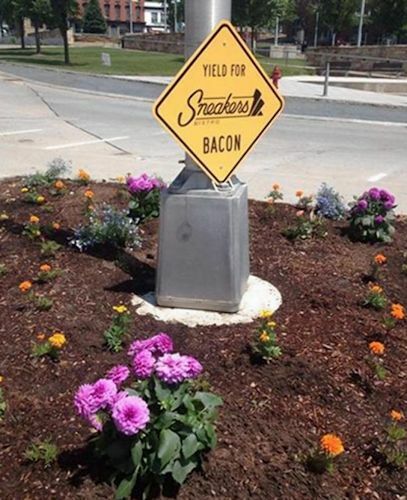 In return, it was awarded a sign on a lamp post that said “Yield for Sneakers Bacon.” A Muslim resident complained that the sign was “insensitive” to those who don’t eat pork. Afraid of offending anyone, the owner took the sign down, called the woman, and apologized and told her the sign had been removed. Apologized for what??? The mayor of the town, Katherine Decarreau, said, “the cool part of living in a diverse community is that it’s not always comfortable. It’s a fascinating place with lots of opportunities for conversation.” Is she kidding? Remind me not to stop in Winooski, Vermont. This is what our country has become. I get it and God help us.